In this Olympic year, against the backdrop of the Greek financial crisis, I thought that the time was right, for a new petition, for people to display the level of support that the issue of the return of the Parthenon Marbles has, both from people in Britain & around the world. Half of the surviving Parthenon Sculptures (also known as Elgin Marbles) from the Acropolis in Athens, are currently in the British Museum. They were acquired by the seventh Earl of Elgin in circumstances of highly dubious legality. For many years, Greece’s government has been asking for them to be returned. Where would the sculptures be kept in Greece? In 2009, Greece opened the New Acropolis Museum in Athens, specifically to hold all the surviving Parthenon Sculptures in a single place. What would the conditions of return be? 1. That the return of the Marbles could take place as a long term, renewable loan. 2. That the exhibition of the reunited sculptures in the New Acropolis Museum could take place as a joint co-operation between the two museums. 3. Greece would send a series of temporary exhibits to Britain in exchange for the return of the Marbles. We are not saying that the sculptures have to be returned by the Olympics – but that a commitment should be made by then, to enter into serious negotiations, with an aim to their eventual return. Who has the power to return the sculptures? We request that the British Government and the British Museum agree to set aside debates over the issue of ownership of the sculptures & engage in serious talks with an aim to equitable resolution of the current situation. In this Olympic year, when Britain has the pleasure of hosting an event that borrows so heavily from Greek culture, now is the ideal time to make such a gesture, to give a commitment by the start of the Olympics that the sculptures will be returned. Returning the sculptures would show the UK’s willingness to help out a friend in need – to repay our debt, from the huge cultural contribution that we have inherited from Greece. Now might not seem like the time to focus on something like this, when there are so many problems in Greece, but the reality is that it would take very little effort on Greece’s part & it would be a way for Britain (who is not contributing directly to the EU’s financial bailout of Greece) to do something to help out the country. 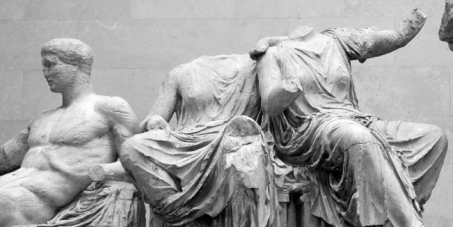 How can I find out more about the Parthenon Sculptures? Please remember to sign the petition and please forward it on to any other people who you think might be interested.